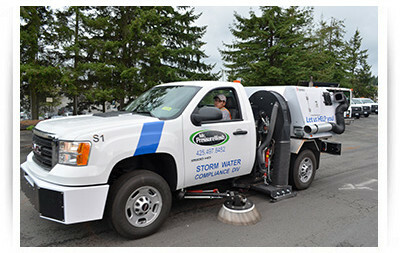 In order to better serve customers, Mr. Pressure Wash recently acquired the NiteHawk Osprey sweeper. At the forefront of cleaning technology, the addition of this equipment enables us to do a more efficient and thorough job cleaning your property. The NiteHawk integrates hydraulic sweeping power with a conventional chassis so that it can sweep at virtually any location regardless of the size of the space. The machine is only 6’4″, meaning it can access even close spaces. Parking garages, parking lots, and other industrial spaces get a lot of traffic in the form of employees, customers, vendors, and more. This means cars and trucks and that means debris. Maintaining these spaces is advisable for many reasons – most of all to ensure your business complies with local, state, and federal environmental regulations. We started Mr. Pressure Wash to fill a void in the cleaning industry – a green company that could promise our clients that by using us you would meet environmental standards. Washington law requires that you keep pollutants out of the water system. Washington law requires that you keep pollutants out of the water system. The correct management of stormwater runoff is a big deal and sweeping is a Best Management Practice (BMP) for dealing with this stormwater runoff. Sweeping regularly by a company that takes the debris away minimizes pollution and ensures your business is in compliance with local, state, and federal laws. Studies show that one of the main ways people choose where to shop is cleanliness. Studies show that one of the main ways people choose where to shop is cleanliness. The first thing your customers see is your parking lot. The way it looks projects an image about how the entire business is run. If it’s filthy and laden with debris, no one will want to stick around to check out your interior. You will create better relationships with nearby businesses. If you keep your property clean and prosperous in appearance, not only will it encourage other businesses in the area to do so, it will likely lead to their favorable opinions. Moreover, using the NiteHawk means we can work on your property even when customers are around. The NiteHawk incorporates a patent-pending hydraulic system that makes it quiet and efficient. The NiteHawk incorporates a patent-pending hydraulic system that makes it quiet and efficient. Because most sweeping is done in areas frequented by people, the level of noise the sweeper generates is important. The VFC hydraulic system ensures the NiteHawk is the quietest sweeper on the market. 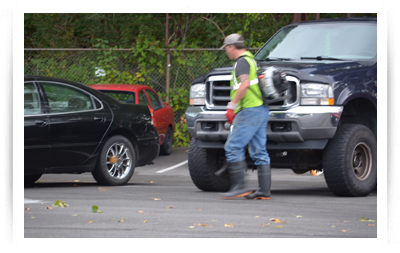 The low decibel level of the system means we can sweep your property in even strict environments – for example, a parking lot that is used 24 hours per day. The NiteHawk reduces noise pollution and allows your business enterprise to run even while we clean. The NiteHawk reduces noise pollution and allows your business enterprise to run even while we clean. You also want to maximize the lifespan of your surfaces. Dirt, rocks, sand, and other types of trash are abrasive. If you leave them on the ground, your concrete won’t last as long and neither will any striping or weatherproofing. Regular sweeping is far less expensive than replacing an entire surface. The NiteHawk is designed to be low-impact so your surfaces retain strength and a sound appearance.